The photomosaic that forms the base for this globe combines a gray-shaded relief airbrush image with color-coded topographic data. The shaded relief data provide interpretations of lunar morphology based on lunar images and were used as a grayscale image for this global mosaic. 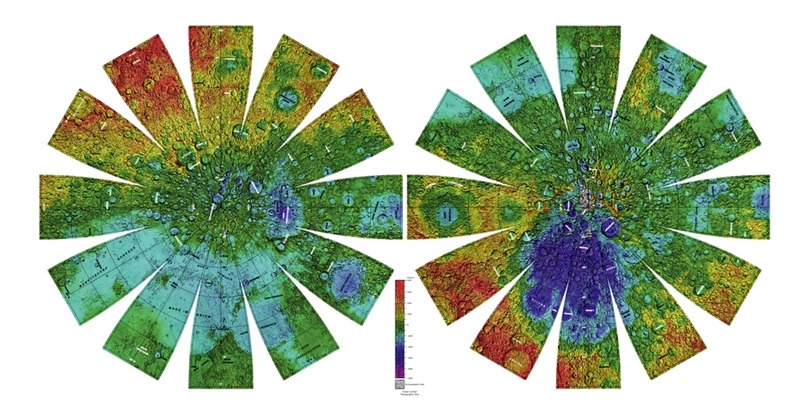 Topographic data from the Clementine laser altimeter were combined with topographic data collected photogrammetrically from Clementine stereo images. The resulting topographic product was colored based on elevation value and combined with the shaded relief data to form the final photomosaic. The shaded relief data were originally published as a series of 1:5 million shaded relief maps. This series included three U.S. Geological Survey maps: I-1218-B, Shaded Relief Map of the Lunar Far Side, 1980; I-1326-A, Shaded Relief Map of the Lunar Polar Regions, 1981; and I-2276, Sheet 2 of 2, Shaded Relief Map of the Lunar Near Side, 1992. These data were digitized and mosaicked into a single digital file. An area of approximately 500,000 km2 near the south pole was not visible in any pre-Clementine images and is blank on the published map. The digitized shaded relief base was updated to show features in this area, based on the Clementine mosaic and recent Earth-based radar images. The digital shaded relief data were registered to a mosaic produced from Clementine images. This registration process consisted of picking points of features that were visible in both the shaded relief data and the Clementine mosaic. To accomplish this, the files were divided into three areas; north pole, equatorial region, and south pole. They were aligned first in the equatorial region and then in the polar regions. Within the equatorial region, an area from 60° south to 60° north, approximately 1000 points were picked. Within the north polar region, an area from 57° north to 90° north, approximately 1900 points were picked. Within the south polar region, an area from 57° south to 90° south, approximately 1100 points were picked. These points were used to reproject the shaded relief map to match the Clementine mosaic. The Clementine LASER altimeter collected data between 79° south and 81° north. The along track spacing varied: over some smooth mare surfaces an along-track spacing of 20 km was achieved; where the instrument lost lock over some rough highland terrain, the spacing degraded to 100 km. The across-track spacing was based on the orbital track and is approximately 60 km at the equator. Elevation values were collected at 72,548 points by the Clementine LASER altimeter. These points were used to interpolate a global topographic gridded digital terrain model for the lunar surface. Because the altimeter points were sparse in the polar regions, the polar regions from this digital terrain model were clipped and only data between 75° south and 75° north were used in this photomosaic. To fill in the polar regions, topographic data collected photogrammetrically from Clementine imagery were used. The Clementine mission collected both oblique and vertical images over the polar regions; these images form stereo pairs that can be used photogrammetrically to collect topographic data. Over the south polar region (90° south - 64° south latitude) topographic data were collected from 667 stereo models. In the north polar region (90° north - 64° north latitude) there were 640 stereo models. Topographic data were collected within each stereo model with a post spacing of 1 km in the x and y directions. This resulted in 1,720,922 points being collected in the south polar region and 1,437,360 points being collected in the north polar region. These data were merged and vertically transformed to align with the Clementine altimeter data. In certain areas, no topographic data were collected; those areas were not colored and the shaded relief image is shown as a grayscale image. The photomosaic is presented in a projection that portrays the entire lunar surface in a manner suitable for the production of a globe; the number, size, and placement of text annotations were chosen to provide a general orientation of prominent features on a 12-inch globe. Features are labeled with names approved by the International Astronomical Union (for a complete list of lunar nomenclature, see Gazetteer of Planetary Nomenclature). A specialized program was used to create the "flower petal" appearance of the photomosaic; the areas of each petal from 0 to 75 degrees latitude is in the Transverse Mercator projection, and the area from 75 to 90 degrees latitude is in the Lambert Azimuthal Equal-Area projection. The northern hemisphere is shown on the left and the southern hemisphere is shown on the right.